Our December 2018 Artifact of the Month is a circa 1900-1910 football jersey with sewn on leather shoulder pads that sold on EBay on December 16, 2018 for $1,925. In the first two decades of American football, players rarely incorporated padding into their uniforms. The early game featured a lower impact, compact style of play similar to rugby. As the sport further evolved into more open formations in the 1890's, violent collisions increased and players began to seek out protective armor to absorb impact. 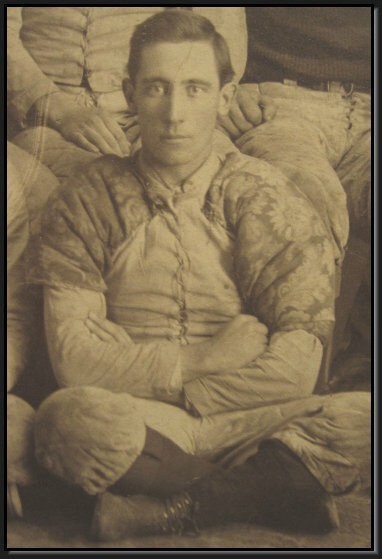 Padded pants and nose masks were the first accepted pieces protective equipment on the gridiron, followed by ear protectors and head harnesses by the mid-1890's. To protect the upper body, players began adding padding to the interior of jerseys by the late 1890's. Shoulder and elbow padding became generally accepted by the turn-of-the-century. In his 1899 "An Introductory Chapter for Beginners," Walter Camp described the uniform of the day, "Jerseys with leather patches on elbows and shoulders are also worn." In 1900, A.G. Spalding & Bros. began mass producing leather covered football pads "owing to the great demand for adjustable pads." The tan leather pads were filled with curled hair and lined with drilling. They could be incorporated anywhere on a players ensemble, including the shoulders, elbows, chest, hips, and knees. By 1905, public outcry against football's brutality helped encourage more substantial jersey padding and supported its widespread use amongst football players. Pads grew in size to cover larger areas of the upper torso. As exterior leather padding evolved in the first decade of the twentieth century so did efforts to design collarbone and shoulder protectors worn beneath jerseys. Early offerings, including Rawlings "Foot Ball Armor" (1902) and Spalding's "Sole Leather Pads for Shoulders" (1902) were primitive and uncomfortable. In 1906, Abraham Schemel invented the "Jacket for Foot Ball Players", which would become the standard design for shoulder pads of the future. However, it wasn't until the mid-1910's that shoulder pads worn beneath uniforms completely usurped sewn on leather pads on the football field.